Placing advertisements, the whole time paying as you go, weekly newspaper, monthly, annually, phone books & searches. The real question is…who will see your ad? Maybe someone will, but it is only if they are looking for your type of business or service, and then, there you are, with all your competition, advertising on the same pages. Yuck! 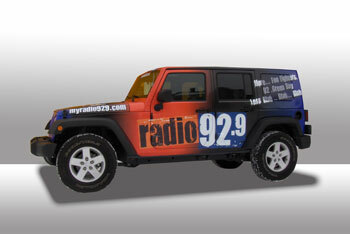 Vehicle lettering & Advertising is the BEST MONEY SPENT in comparison to any other form of advertising. Compare what you currently spend or do not spend. Times are changing daily. You need to stand out! Be different’ and utilize your existing Vehicle. Everyone, thousands of people… every single day, will see your vehicles with your Business Image / Brand! Weather they realize it or not, they will read it. And have to notice it amongst themselves on the roads. 24/7 & 365 days a year, your business is out there! All Day & All Night too! Driving or Parked! The graphics are working to tell everyone who you are & what you do, and most importantly how to get to your website or call you. Because it is a 1-time purchase, you get it done and that is it! No renewals & no monthly bills etc…. If it gets you a 1k, 5k, 20k, maybe even a 100k job for you business it definitely paid for itself and then some. Never mind for the REST of its life on the vehicle! The big difference or goal with us at Adpro Design is to first have it done very legibly, tasteful, and to stand out & look unique. Unlike some of the others out there with too many circus like colors and effects etc. That is where it is worth spending time & money, developing that image for your company’s reputation. Some people do skimp on their vehicles lettering and try to just get it done & as cheap as possible. Saving a couple hundred bucks here & there. That just will cost you more in the end, either in Bad materials / peeling, Bad Design (which is very common) UN attractive lettering / non legible. Any company will say they do wraps, but do they do them well? Adpro Design vs. the others / imitators, is simply seen by the difference in the design capabilities and our love for cars, transportation & motor sports.